President Donald Trump speaks to supporters during a rally for Sen. Luther Strange at the Von Braun Centre in Huntsville, Alabama, on Friday. WASHINGTON ― Buried beneath the war President Donald Trump has launched against the NFL over protests during the national anthem is a new claim about Russian involvement in his election: that it did not help him at all. In so doing, Trump is directly disputing a conclusion by U.S. intelligence agencies that Russia did precisely that. 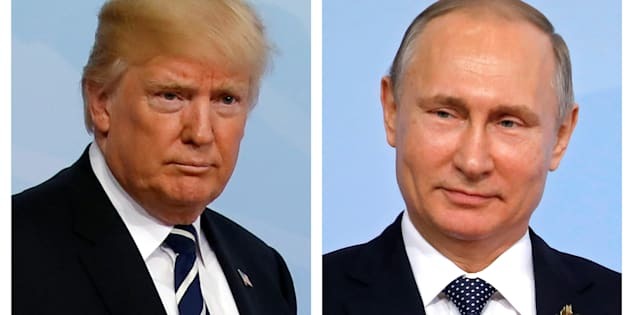 Justice Department special counsel Robert Mueller, as well as the intelligence committees in the House and Senate, are examining the scope of Russian assistance to Trump, and are further trying to determine whether the campaign colluded with that assistance. “I find it troubling and frankly odd that the president has repeatedly denied that Russia was responsible for interference in the 2016 election ― even in the face of unanimous agreement among our nation’s intelligence agencies,” said Virginia Democrat Mark Warner, the ranking member on the Senate Intelligence Committee. “No one has ever alleged that any foreign interference efforts, whether from Russia, Ukraine or elsewhere, had any impact on vote tallies or changed the outcome in any way whatsoever,” she said. Nevertheless, Trump’s latest attempt to downplay Russia’s role in the election goes beyond his previous assertions. Over time, those have included the idea that it could not be known who had interfered in the election – he has variously blamed a 400-pound person in his bed; someone in New Jersey; or some unknown country other than Russia – but that whoever it was, the meddling was not determinative. Friday appeared to be first time that the president flat-out claimed that Russia did not help him win. U.S. intelligence agencies, however, plainly stated in a Jan. 6 report that not only did Russian leader Vladimir Putin interfere in the election, but that he also had a desired outcome. The intelligence community’s report also mentioned that Russia used social media “trolls” to recirculate and amplify negative news coverage of Clinton. Social media giant Facebook disclosed on Sept. 6 that Russia-linked accounts purchased political ads starting in 2015, while company founder Mark Zuckerburg announced last week that it would turn over those ads to congressional investigators after initially refusing to do so. Trump won the election thanks to narrow victories in Wisconsin, Michigan and Pennsylvania, by a cumulative vote margin of 78,000. Investigators are examining whether the Russians had help targeting key voting groups in those states using data from the Trump campaign. This has been updated to include comment from a White House spokesperson.